On 26 June 2014 the UK Government published a second Consultation on the introduction of regulations for plain (standardised) packaging of tobacco products to run for six weeks until 7 August 2014. To explain how the policy would work, the consultation included a set of draft regulations with the rules for the packaging of cigarettes and hand-rolling tobacco, as well as requirements for the appearance of individual cigarettes. Alongside the consultation, the Government also published an illustration (see image) of what plain packs would like, a further consultation-stage impact assessment and an equality analysis. The impact assessment analysed the anticipated costs, benefits, and impact of the proposed draft regulations, concluding that there is no net cost associated with the legislation. The equality analysis explored the potential of plain packaging legislation to promote equality within the UK and concluded that plain packaging legislation would likely promote public health and minimise health inequalities in the UK. The consultation was open to anyone with an interest in plain packaging, with the Government asking "in particular, for views on anything new" since the last full public consultation, which took place between April and August 2012. 5 What Happened After the Second Consultation? Examining evidence supplied by British American Tobacco (BAT) and Japan Tobacco International (JTI), the authors found that the companies repeatedly misquoted studies that supported plain packaging, distorting their main messages. In addition, they commissioned academics who subjected many of these studies to a ‘mimicked’ version of scientific review, using unscientific methods and dismissing every single one as flawed, despite the fact that the studies were published in peer-reviewed academic journals. The companies also sought to deflect attention away from packaging by promoting an alternative body of evidence while withholding their own research on the impact of packaging on cigarette consumption. Industry documents previously made public indicate that packaging: is a key element of tobacco marketing; is used to increase product appeal to targeted groups, including young people; and can misleadingly suggest that certain products have lower health risks than others. 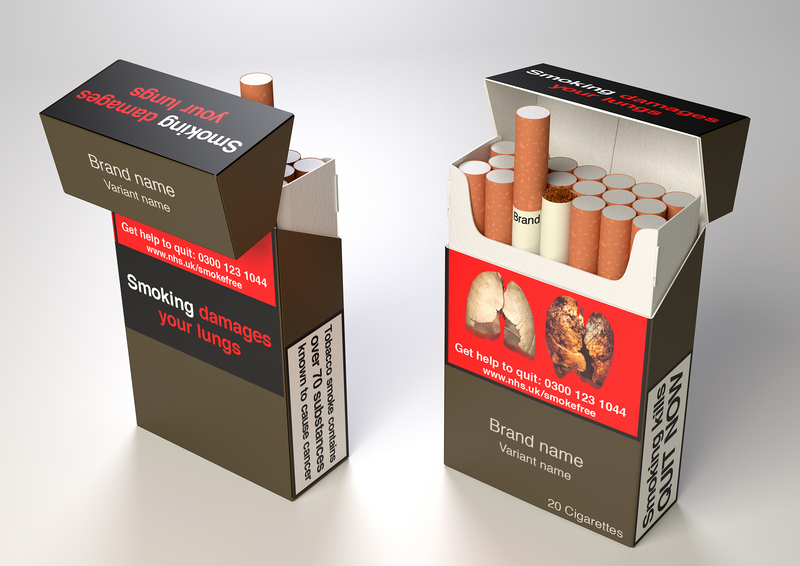 In the UK, the Moodie Systematic Review of the available evidence on the potential impacts of plain packaging concluded in 2012 that there was strong evidence to suggest standardised packaging would reduce the attractiveness and appeal of tobacco products and increase the effectiveness of health warnings. In spite of this, in the UK, further to a four month public consultation and 11 months of deliberation on the topic, the Government decided it would adopt a ‘wait and see’ approach to observe the experience in Australia of standardised packaging. Parliamentary debates and media statements indicated that doubts over the evidence were the main reason for the Government’s hesitance. The publication of the draft regulations in June 2014 raised hopes that plain packing would be approved in the UK before the May 2015 general election. However, it was known that this would have to be a very tight turn around. After the six-week second consultation period on the draft regulations, the regulations would have to be approved by the EU Member States before they could take effect, a process which can take up to six months. Given this, plain packaging, if introduced in the UK, was not anticipated to come into effect prior to Spring 2016. CancerResearch UK urged the Government to move quickly, pointing at the recent Australian Government Department of Health figures that revealed a significant five per cent drop in cigarettes sold per head of population in the first year after plain packs were introduced in December 2012. "The tobacco industry is gearing up for a last ditch fight against the Regulations, hiring agencies to get emails sent to the Prime Minister, and publishing misleading and false claims about how the policy has worked in Australia , and about the effect of the policy on the illicit tobacco trade. But standardised packaging remains popular with the public." The tobacco industry in Australia reported an increase in tobacco sales from 21.015 billion cigarettes in 2012 to 21.074 billion in 2013, and claimed that this showed plain packaging was not working. Although the industry reported a small (0.28%) increase in sales year on year, it failed to report the increase in the Australian population between 2012 and 2013. Adjusted for population, tobacco sales per person fell, from 920.4 cigarettes in 2012 to 906.9 in 2013. A potential increase in illicit trade was continuously brandished as a reason to delay the regulations. KPMG data from Australia purported to show an increase in illicit in Australia following the introduction of plain packaging legislation. However, KPMG were heavily criticised for their methodology by the Cancer Council Australia. The Chantler review concluded that plain packaging need not increase the illicit trade in tobacco. All the key security features on existing packs of cigarettes would also be present on plain packs (including coded numbering and covert anti-counterfeit marks). Andrew Leggett, Deputy Director for Tobacco and Alcohol Strategy at HM Revenue and Customs has said about plain packaging that “We’re very doubtful that it would have a material effect [on counterfeiting and the illicit trade in tobacco]”. Furthermore, the Australian Government and customs officials have rejected tobacco industry claims that illicit trade in Australia has risen since the introduction of plain packaging and peer-reviewed research supports this position . See also: Plain Packaging: Have Illicit Levels Risen in Australia? Another YouGov survey published in June 2014 shows just over one in 10 adults trust the tobacco industry’s plans on how to cut smoking rates. Nearly two-thirds (64%) said they would not trust tobacco industry arguments on smoking prevalence reduction. What Happened After the Second Consultation? b.Cabinet decision on Regulations through Home Affairs Cabinet Committee, chaired by Deputy Prime Minister (Nick Clegg MP). The write round for Cabinet clearance via correspondence must start by Wednesday 14th January, as the process lasts at least six working days. j.Thursday 26th March: last sitting day of this Parliament. Throughout the debate, the tobacco industry aggressively lobbied the UK government against the regulation . The industry disingenuously misused evidence to suggest that plain packaging does not work by promoting a statistically insignificant finding as proof that youth smoking rates in Australia increased following the introduction of the policy in December 2012. In the letter, the government explanation that little can be done until the six-month European Commission notification period is complete is described as an “excuse for further delay” and a “complete red herring.” MPs also voiced similar concerns over the delays to implementation and underlined the urgent need to move forward with passing the regulation. "Having considered all the evidence, the Secretary of State and I believe that the policy [plain packaging] is a proportionate and justified response to the considerable public health harm from smoking tobacco. The Chief Medical Officer has confirmed this view. I now propose that we lay regulations for standardised packaging in this Parliament to allow for them to come into force at the same time as the European Tobacco Products Directive in May 2016. In doing so we would be bringing the prospect of our first smoke-free generation one step closer." Ellison said a timely free vote would be open to MPs in both Houses allowing the legislation to come into force before the General Elections if voted through. On the same day the UK Government made its announcement, Cancer Research UK (CRUK) released the latest figures from a survey of 1800 British Adults revealing that 72% were in support of plain packaging across a broad political spectrum (75% of both prospective Conservative and Labour voters, 80% of Liberal Democrats and 64% of UKIP supporters supported the measure). Only 15% were opposed. On Wednesday 11 March 2015, MP’s in the House of Commons voted in favour of plain packaging (367 for and 113 against). The measure was broadly supported by Labour and Liberal Democrats with opposition coming from Conservative representatives. The legislation was subsequently accepted into the House of Lords on 16 March 2015 and will come into effect on 20th May 2016 alongside the EU Tobacco Products Directive. When plain packaging regulation was introduced in Australia in 2012, the tobacco industry launched an expensive legal campaign against the measures; the claims were dismissed by the High court and costs were awarded in favour of the Australian government. Australia also won a claim made by Philip Morris International (PMI) under The Australia – Hong Kong Bilateral Investment Treaty in December 2015. Results of legal claims made under the auspices of the World Trade Organization are pending. Despite these threats, legal opinion commissioned by ASH and Cancer Research UK, published in May 2015, found that plain packaging laws proposed in the UK were in line with EU law regarding trademarks and fundamental rights and concluded that tobacco companies would not be entitled to compensation where countries introduce legislation to protect public health. PMI and BAT filed separate lawsuits against UK plain packaging legislation on 22 May 2015. The cases were taken against the British Government for projected losses in income, subsequent to the legislation. The tobacco companies argued that plain packaging breached intellectual property and was in violation of UK and European Law. Lawyers for the companies drew on a PMI commissioned legal opinion from Lord Hoffman, a former senior Appeal Court judge. See Plain Packaging in Australia and Countering Industry Arguments against Plain Packaging for more information. S.Ulucanlar, G. J. Fooks, J. L. Hatchard, A. B. Gilmore, Representation and Misrepresentation of Scientific Evidence in Contemporary Tobacco Regulation: A Review of Tobacco Industry Submissions to the UK Government Consultation on Standardised Packaging, PLOS Medicine, 25 March 2014. ASH Media Briefing on standardised packaging, including evidence and pictures. APPG on Smoking & Health Political Bulletin Issue 8, Spring 2014. ↑ Department of Health Consultation on the introduction of regulations for standardised packaging of tobacco products, 26 June 2014. The summary report of the 2012 consultation was published in July 2013. ↑ See p.48 of the Explanatory Memorandum to the Australian Excise Tariff Amendment (Tobacco) Bill 2014 and p.6 of Sir Cyril Chantler’s independent review into standardised packaging. This page was last modified on 19 May 2016, at 12:53.